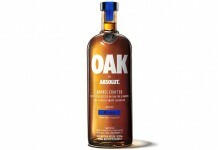 The vodka category is beginning to go through a real identity crisis. Now that the flavored vodka boom is clearly ending, vodka companies are scrambling to figure out ways to hold on to their growth and remain relevant in a marketplace that is increasingly shifting towards whiskey. Bacardi’s Grey Goose is one of those brands that’s really trying to navigate these changing vodka waters. In 2013, Grey Goose saw a sharp drop in sales, with a whopping 5% decline (source: Impact Databank). Part of this sharp decline is attributed to Grey Goose’s decision to not chase the flavor trend too hard, but a more significant factor was unexpected competition from non-premium brands like Tito’s Vodka and Deep Eddy’s Vodka, which took significant share away from premium players like Grey Goose. The problem with the vodka category, and its players, is that the category has enjoyed such effortless success for decades with very little need for innovation (aside from coming up with wild and crazy flavors to release, and then discontinuing them). While we don’t think vodka is going to lose its dominance any time soon, the landscape is clearly changing, and brands have no maps to navigate the road ahead. This changing landscape is what makes the new Grey Goose VX so important. 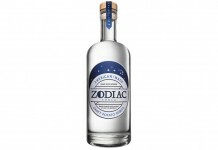 Although Bacardi is testing the waters for this product in Travel Retail first, it’s clearly a peek at how one premium vodka brand is responding to the competition. Oddly enough, Grey Goose VX isn’t technically a vodka: the TTB has slapped a ridiculous “Spirit Drink” classification on the brand and bottle, which goes hand in hand with their outdated classification for the vodka category itself. Grey Goose VX is essentially Grey Goose vodka “finished with a hint of precious cognac”. While there’s no specification on which cognac is in the mix, it would be reasonable to assume that it comes from Château de Cognac (a.k.a. Otard), the same cognac house that Bacardi uses for their D’ussé Cognac. The Grey Goose VX bottle does disclose that it’s a blend of 95% Vodka and 5% Cognac, the same ratio that’s common with spirit whiskey. There’s also some sort of filtering process, as the final Grey Goose VX is crystal clear. 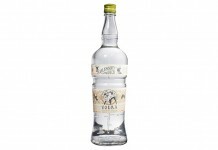 Grey Goose VX is packaged in a bottle that very much looks like a fusion of the classic Grey Goose Vodka bottle with the traditional bottles often used for XO Cognac (very similar to Chateau de Montifaud Cognac). While the bottle looks stunning, it’s a hefty bottle and completely unyielding to pour from, making spills almost a guaranteed occurrence. 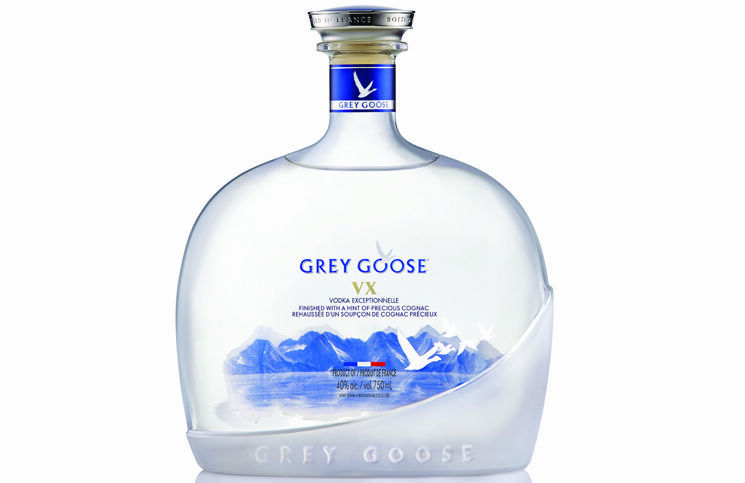 Grey Goose VX (80 proof / 40% ABV,$74.99) – the nose is clearly different from the base Grey Goose Vodka, with soft cognac notes including honey, raisin, milk chocolate, and shortbread cookie. As with the base Grey Goose Vodka, the nose on Grey Goose VX is soft and unassertive without any vapors. The entry for Grey Goose VX follows the nose pretty closely with cognac flavors of raisin, milk chocolate, shortbread cookie, iris, dried apricot, and white grape. It’s a nice grouping of flavors and they are presented well and solidly integrated. The midpalate is a continuation of many of the flavors introduced in the opening, with raisin and dried apricot most pronounced. There’s a bit of pepper spice and a touch of ginger, and as with the traditional Grey Goose Vodka it is a fairly restrained and mellow midpalate. The finish for Grey Goose VX is the most vodka-like part of the taste experience and most representative of the traditional Grey Goose Vodka, with light wheat notes tapering to a dry finish. Grey Goose VX does an excellent job of infusing some of the delicious flavors that cognac offers without fundamentally disrupting the vodka experience. The integration and balance, while preserving the core Grey Goose character, is masterfully done and light years beyond Twenty Grand, one of the other vodka/cognac blends on the market. The big problem with Grey Goose VX is the price. Given that Grey Goose Vodka typically sells for around $30, the leap to $75 a bottle for Grey Goose VX is pretty dramatic. Grey Goose VX at $75 also really begs the question, “Why not spend the money on a good cognac instead?” Once ultra-premium vodka leaves the $40-$50 price point, there’s a real question over what you’re really paying for. With Grey Goose VX, it’s the cache of owning an ultra-premium Grey Goose product along with an expensive bottle, but is that really enough to justify $75? We can understand Bacardi’s interest in re-elevating the Grey Goose brand to try to pull it out of a head-to-head battle with brands like Tito’s, but they’ve gone too far with their pricing for VX. Perhaps the bigger challenge for VX may be in how it’s consumed. Will vodka drinkers will be open to consuming a vodka neat or on the rocks? We’re not sure, but if Grey Goose can convince them to think of vodka as something that can be sipped, it could greatly impact the entire high end category of vodka. Grey Goose VX debuts this month in European Travel Retail starting with Paris Charles de Gaulle Airport and then expands to Canada and the US in September of 2014.